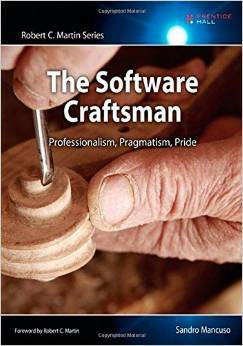 I just finished a book on software craftsmanship: The Software Craftsman – Professionalism, Pragmatism, Pride. It’s a good intro to what a craftsman does and what he should do. It’s a good book for junior programmers. It can help you get on a right path. It can give you motivation to do things right. I would have enjoyed the book a lot more earlier in my career. For more experienced people, for people that consider themselves a craftsman (like myself), it’s a quick and enjoyable read. I did not learn much, though. So in a sense, I could have spent my time elsewhere. But I think it’s good to find out that people think “like me” are out there. It’s good to read about their experiences. Plus, it’s a quick read. I did learn a few things. The author gave me an idea to try in our daily standups. I will introduce “What have you learned yesterday?” question. The team I manage has learning as one of our principles. It’s a good idea to raise the importance of of, and be reminded on a daily basis. I will do that. The 2nd motivation I got from the book is about Community of Practice. I am thinking of starting one at my company. It will be based on best practices, new technologies, things worth checking out, etc. I think it’s a great idea that will allow me and other seasoned developers to step up and share some of the things we’ve learned. Those learnings seem small but I consider them big. They’re leadership activities, IMO. And having learned that from this book makes it totally worth reading for existing craftsman. You will probably learn a few things from it as well.